A decision has been made, in response to an emergency situation to close the campus childcare center at the end of fall quarter. We will institute a pilot project for winter and spring quarter to provide direct financial assistance (vouchers) to augment student’s childcare expenses. Parents have been notified and we are providing support through our Division of Student Life and Engagement. The center’s childcare facility that currently serves 68 student parents has been reallocated as the college looks to move faculty and staff from its successful International Student program out of SCCC’s South Annex building which was deemed unsafe following an inspection this summer. We’ll have more on the construction underway on the campus and what SCCC is doing about the South Annex later. The bigger concern for SCCC parents is December 15th — the childcare center is currently slated to shut down mid-December with the end of the winter quarter. The program has operated for over 30 years, and like its North & South Seattle Community College counterparts, has sought to support students who are parents. Closing now means talented teachers become unemployed, both hired & volunteer aids will loose out on valuable hands-on work experience, and other students & families like mine will be forced to evaluate if educational goals are even possible anymore. The childcare center meets the mission and values of the college in a way that the program which will be displacing it does not (http://seattlecentral.edu/sccc/mission.php). This short-sighted decision will have a tremendous long-term impact on the Capitol Hill community and deserves a full review of available options. Parents are asking the administration to delay closing the childcare center at least to the end of the year, and extend the temporary arrangements which were made this fall for the occupants of the south annex, while also allowing for a committee of effected parties to see if there are other possible solutions. It was promised in the Spring of 2011 that the childcare center would be open all year, and we’re just trying to get that promise upheld. Seattle Central has not yet responded to CHS’s inquiries about the decision to cut the center. Frequent CHS contributor Dotty DeCoster has a unique perspective on the situation. She was there in the center’s early days serving as co-chair of the SCCC Child Care Organizing Committee from 1969 to 1971. For those of you who may be confused, this is not the cooperative preschool program at SCCC, which did remain, at least in part, in the budget for this year at SCCC despite efforts to cut it altogether. This is the student child care center, which opened in the late 1960s or early 1970s in the church across the street from the college in response to pressure by the SCCC Student Child Care Organizing Committee. It is specifically designed to provide child care services to the children of students attending the college, and is not an academic program as the cooperative preschool program has been since before the community colleges existed. During the late 1960s and early 1970s, SCCC had a large population of students who were supported either by federal assistance through the G.I. Bill or through the W.I.N. program – an astonishing number of us were either recent vets or welfare mothers. The average age of the student body was something like 27. It was a time when federal and state policy encouraged people to find training to enter or re-enter the job market. SCCC was renowned for its technical preparation programs at that time, heir to the Edison Technical School as well as providing college courses. A great many of us found we were in desperate need of child care services in order to go to school. I thought at first this was a women’s issue. This thought lasted about five minutes as I spoke with fellow students, many of whom were recent vets whose wives worked while they went to school and they needed child care to make this work. After much agitation, we obtained the support of then college President Moore and business manager Herb Zimmerman (whose portrait hangs in the Broadway Performance Hall). Enterprising folks from the Early Childhood Program, especially Frances Pringle, and equally enterprising students, worked with the church to find space and put together a remarkable program that was designed specifically to meet student parent needs. This program was only a part of the effort related to early childhood at the college then – it included training for child care teachers, a co-operative preschool hub, a facility for teaching these and the student child care center. There’s a look at the past. The future of the program? SCCC’s student parents are working on a better plan in a sea of program reductions and budget cuts and with a tribe of Occupy Seattle protesters nearby. Maybe somehow it will all fit together and work out. One small thing people can do if they wish to help, is to “like” our recently setup page on Facebook. Of course, contacting President Killpatrick or SCCD Chancellor Jill Wakefield would also be helpful. Thanks for the perspective, Dotty. I was a South Seattle CC daycare kid. I can still remember it, all these years later. As you say, my dad was a vet. The budgetary restrictions the community college is facing could be lessened greatly if we could redistribute wealth in our society away from the wealthiest and into social programs benefitting all. The state of Washington has one of the most regressive tax structures in the nation resulting in a remarkable, even for this country, mass of wealth at the very top of the spectrum all while those who are trying to gain training for today’s job market are unable to catch a break. If the school was flush with cash it could find a way to maintain this service for it’s students. Catching breaks instead of working hard. A recipe for success. I think it’s time the occupy mindset do a little research in to how much exactly the ‘top wealth’ in this state do contribute to those that need help. Focus on the tax, sure, but look at the contributions made year after year to many organizations. Enough gimme gimme gimme. The reason this situation is so upsetting is because ONE person, President Killpatrick, has made the decision to close the childcare center. This IS NOT a budget issue, this is an “emergency” which allows the president to do anything he pleases. None of the excuses for closing the center make sense. With help from the community and input from the campus, I DO believe it is absolutely possible to keep the center open. If it were really an space “emergency” the school would close the gym, for example. The sad thing is, once the childcare center is gone, it is likely never to return. I appreciate hearing the history from Dotty as it reminds us that this is a COMMUNITY college! Unfortunately, the SCCC administration has decided to give preference to accomodate international students and the money making programs that they are enrolled in. Actually most of the international students ARE NOT enrolled in actual community college classes, they take classes through the FOR PROFIT language institute run by the school. What about the tax-paying resident students? And why can’t the school find a way to keep both the childcare center AND international programs running? I’m tired of people complaining that they have to drop out of school because of the economy and various cutbacks. Are student loans not still readily available? 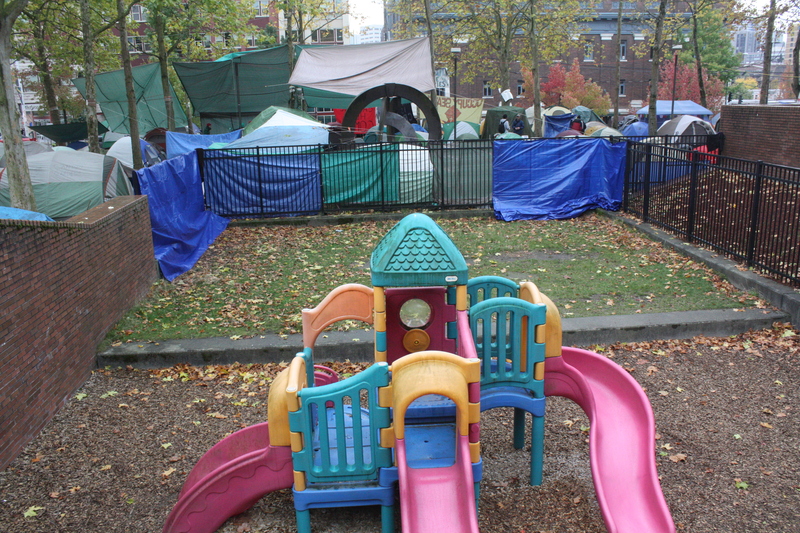 There are many child care centers in Seattle and on Capitol Hill. Yes, they may be less convenient for SCCC students, and perhaps a bit more expensive, but sometimes you have to adapt to a new reality. I assume Pres. Killpatrick is making this decision in order to continue to provide adequate facilities for the international students, and therefore maintain that revenue stream at a time when the state is cutting back his budget. That seems like a pretty good idea to me. That “for-profit” language school is not an auxilary. I’d estimate (as an employee) that about 85% of their revenue feeds directly into SCCC. The other 15% is for very basic operating costs. I’m an employee of that international student program, and this is faulty reporting. The SCCC Childcare center was NOT closed just so that International Programs could move in to the space. There has been talk of it closing for years, both because of budgetary challenges and HR problems. Yes, we are moving in to the space. International Programs is currently working out of a building where we can only travel to our 2nd or 3rd floor offices by elevator because the stairs are bound to collapse at any moment. This is an elevator that breaks down at least once a week. It’s not safe. Considering how much revenue international students generate for instruction (for classes that sometimes they never take), they should have access to a structurally-sound International Student Center, which houses countless resources for them. Do NOT misconstrue what is written here as international student needs pushing out domestic/local student needs. As President Killpatrick stated, SCCC is still providing students with childcare resources, mostly through vouchers. This information is all presented very subjectively, which I’m disappointed in. Especially considering this has the potential to have significant impact on how the community views SCCC. All things considered, that school has some great programs that benefit Seattle greatly. The international student program is one of them. Thanks Nikki. All we have to go from is the statement from Killpatrick. I left several messages and email with SCCC communications about this issue starting more than a week ago asking for more details and none of those were responded to. We’re not done reporting on it. greatest number of students. We must reassess how services can best be provided. services and provide other kinds of assistance to parents who need childcare. an annual expenditure per student parent of over $2600. stretched to benefit many more student parents. International Education Programs has been impacted by the condemnation. three-month notice, allowing time for parents to transition to other childcare. will be available to student parents by November 1. No problem, I just wanted to make sure that readers get the whole picture. The person who was doing most of our communications work just left SCCC, so that may have been why you didn’t receive a response. Glad I could clarify a few things! This is a hard time on a lot of fronts for SCCC, and the SCC District as a whole. Nikiki, I feel that the reporting done on the closure is accurate, but maybe you did not like my comments. I am not against International Programs, in fact, I am an TESOL teacher myself and make my living from these students. My husband was an international student at SCCC ten years ago and is now a photography student at SCCC and we have a son in the childcare center. It IS true that the ELP programs ARE money-making for the school, whether or not they feed back into the school. You have actually given more information about the closure than parents and the community have been given by the administration. And thank you for admitting that, YES, they have been considering closing the childcare center for a long time. The way they did it, by announcing TWO DAYS before the quarter began and leaving students who rely on these services IN THE MIDDLE OF THE SCHOOL YEAR scrambling to find chlidcare – is not acceptable. Again, if this were truely an emergency, they would find emergency space for those who occupy the South Annex until the end of the school year and then give sufficient notice for the students who use the childcare center. For those of you who do not have young children, it is almost impossible to find quality, affordable daycare in Seattle and EVEN WITH THE VOUCHER SYSTEM, all of the other childcare options will be at least $1000 more a quarter for students. Most daycares are full by March for the Fall. These are TAX-PAYING, RESIDENT students who will be affected. International students, while contributing to the local economy and paying 3x the amount of tuition, are not tax paying residents WHO FUND THE STATE COMMUNITY COLLEGE SYSTEM. So, all of that aside, because it is not innacurate, why can’t the administration find a better way to meet the needs of both the south annex programs and offices AND the childcare center. Because the school wanted to close the childcare center anyways, there was not much thought on how to save it for the school year – at this point, this is all we are asking for. Wherea the creative, innovative leaders when you need them? I completely agree with Stephanie. You don’t announce two days before the beginning of the quarter/school year that the child care center, a place that student-parents rely on so they may continue their education, is going to close. Which leaves us, the student-parents, in a really bad spot. First, most quality daycares have waiting lists and enroll children the previous year before they even start their care. Second, it obviously has to be a daycare that is reasonably priced. And third, if we happen to find a daycare that does have availability, it also has to be somewhat close in proximity (for those parents who are car-less and the only daycare they can find is in North Seattle, how does that work?) and offer half-day options because I don’t need or want my child in daycare all day long. So “finding another child care center” isn’t as easy as one may think. If they knew the building that houses the international students has unusable stairs, how is that even safe in terms of evacuation? Did the sudden unsafeness of it just occur to them recently? And why wasn’t this decided well before the quarter began, so parents might have had a chance to enroll their children elsewhere? Since these things WERE NOT DONE, I find it unacceptable to suddenly kick the childcare center to the curb without looking at other options and genuinely working toward a solution that would benefit both the international students and the parents of the child care center. You’re not reading. The childcare center is not closing because international programs needs to move. Period. The stairs were condemned 6 months ago. My comments were not about the need for a childcare center. Although I do not have children, I see this as a great loss to our community and was challenged ethically to see the positive in international programs being able to move there. Well, then, what you are telling us and what the administration is telling us are two different things. Administration is telling us that the reason for the childcare center closing is BECAUSE of the emergency of the stairwell being condemned (read the above letter). If, in fact, it was condemned six months ago, then there is even MORE reason to be upset that the president is using this as an excuce to close the childcare center. The student parents were PROMISED in a May 31st letter that the childcare center would remain open for the full 2011-12 school year as secured in the budget for this school year. Here is the thing, when a school run by the government decides to close a long standing program there is usually due dilagance paid and community input. Decisions are usually made in accordance with the budget AND with the mission, vision, and strategic plan of the school AND there are public records of this process (meeting minutes, etc.). There are NO public records of this decision because ONE PERSON has made this decision (see my next post). He did not want to attract attention to this issue. If he knew he was going to close the childcare center six months ago WHY DIDN’T HE TELL PARENTS THEN!!!! I am responding to your email request of Tuesday, October 18. Ultimately, it is the decision of the President to close the child care center due to the emergency conditions the college was undergoing. This information was shared at the open forum meeting with the staff of the child care center and the parents. There are no responsive college records to your request other than the records that were provided to you. Again, the ultimate decision regarding closures of college programs rests with the president of the college. Actually, I just took a look at these and I don’t see anything in the meeting minutes pertaining to either the “emergency” nature of having to close the childcare center or the actual decision that was made to do so. Maybe I could have the meeting minutes and agendas from the President’s Cabinet Meetings from the last 4 months (since June 2011). I want to know WHEN and WHO made the decision to close the childcare center. These details should be in the public record somewhere. I have received your public records request dated Tuesday, October 11, 2011. Please call me at (206) 934-5487 if I can provide further information. Seattle Central did communicate when they were evaluating programs for closure last May that the childcare center was not going to be cut this year. How is it possible that three months later it is being entirely displaced by an enrichment program? In addition to the childcare center, the adjacent parent-child center (Parent Ed) and the ASL programs were also slated for elimination — and ASL was already discontinued. The Parent Education program serves 500 families each year at a nominal cost to the college — and the program dates back to the founding of the college, not to mention the cooperative preschools affiliated with the program which are some 80 years old in Seattle. Seattle Central, in its zeal to attract full-tuition paying, foreign students, is alienating families in its own community. I don’t see how this decision is in alignment with the college’s mission. Isn’t it illegal to have drug activity within a specific distance of any school w/children (e.g., Drug Free Zones)? I believe the distance between drug activity and a school is 1000 feet. The photo shown looks like they are adjoining the school playground which is school property. Dr.’s Kilpatrick and Wakefield care very much, but contacting them will NOT help. The seattle community colleges have lost fully 33% of their funding over the past three years. They have been forced to gut administrative positions and eliminate entire programs to remain open. They’re trying to run a college with increased enrollment on one third less funds. If you want to help you should contact the legislature…they draft and approve the budget that Dr. Kilpatrick has to work with. I don’t have kids and know as much about day care and the laws or lack thereof regarding daycare as the next bachelor so take it as just a suggestion. Why can’t the parents who utilize this daycare now, rent out a vacant/suitable retail spot on the hill and run the daycare by themselves and/or with the former SCCC daycare employees? Pool the voucher money from SCCC fairly to pay the employees and possibly have a parent or three volunteer at any given time to staff the facility. Possibly, find other parents (not SCCC students who maybe can pay a premium and be willing to do so) who were rejected by the long lists at other nearby daycares and maybe find a way to raise the lacking funds.